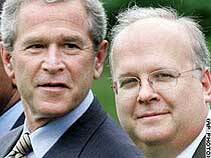 Seldom, if ever, has a political consultant come along with both the power and effectiveness of Karl Rove. The man is a genius in coalition-building, that modern day making of whole boards from slivers. Having said that, I think he’ll be the last rather than the first of a new breed, a sort of one-trick pony whose effectiveness is just too stultifying for any but the weakest of candidates. And, while we may have more than our share of weak candidates, it’s not often an admitted failing. Ego at that stratospheric level doesn’t often allow much handling. It’s not in the nature of presidential candidates to give over their destiny to a strategist. It's perhaps useful to remember that the Republican majority in Congress, the first in half a century, had nothing to do with Karl. 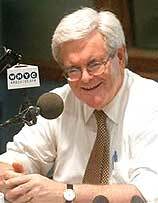 Newt Gingrich engineered that palace coup with his disingenuous Contract With America, six short weeks before the mid-term 1994 elections. Nor did Karl have a hand in building the K-Street Republican stranglehold over lobbyists. That was vintage Tom DeLay. So, when we come down to it, Karl gets the credit (and massive credit it is) for twice seating a president who once lost the popular vote and a second time lost the public confidence. He accomplished that miracle in the first term by getting Bush close and then kidnapping the Supreme Court; in the second case by scaring the pants off the entire nation that the sky was falling and terrorists would strike again. Effective, you have to give him that. Two times, count 'em pardner, presidential elections that were presumed by the pundits to be lost causes were turned on their heels into victories. The required whipping up of narrow-based constituencies leaves a candidate vulnerable and perhaps even captive to disparate philosophical groups; i.e., by example, a coalition of gun-nuts, tree-huggers and global interventionists. Not compatible, these sliver groups without a common denominator, are hard to keep happy and even harder to justify to the nation as a whole. Rove-Code success requires iron discipline of the Congress, special interests (such as lobbyists), Cabinet-level departments and the courts. That is the antithesis of democratic government. Coalition, bi-partisan government is still the ponderous model-of-choice for Americans in Washington and their home states. Rove-Code administration is in a constant state of coming undone. It’s a juggling act that requires a president to keep fifteen balls constantly in the air, the slightest slip of the hand bringing on collapse. It’s simply too tiring and distracting a way to govern. Again, it’s a judgment-call and may be wrong as wrong can be, but I suspect that we’ve come a long way as a nation since 9-11 and learned some things about aftermaths. The dramatic and jaw-dropping image of the World Trade Center disintegrating in collapse has largely been assimilated into our collective history. Everyday life has leveled out. Striking back from fear and anger hasn’t worked as well as we all had hoped, no matter our politics. Republicans and Democrats alike are shocked by the position in which we find ourselves today, at war with an increasing portion of the world, estranged form out traditional allies, in moral chaos at home on both business and governmental fronts, edgy with our friends and neighbors, as well as in a state of economic unease. We seem and we are pulled apart as a nation rather than brought together. So, I decipher from all that, a national hunger to believe. We are believers, we Americans. Optimists, problem-solvers, takers-on of the thorniest dilemmas and overcomers when we find ourselves at odds with our image of ourselves. We are an image-drivensociety and that’s not so bad a thing to be when the chips are down. So, Karl, thanks for the memories and it’s been an interesting ride. But I doubt we’ll walk your road again.